Guest blog: How do ROLSI articles describe embodied activity? Guest blog: How do we get others to help us? IprA 2015 (1): International Pragmatics Association (IPrA) Conference, Antwerp, July 2015. The accelerating turn to multi-modal analysis is visible in the increasing number of high-level meetings and symposia devoted to the latest in video techniques and analysis. I’m delighted that Sylvaine Tuncer, whose work is at the frontiers of sociology, CA, ethnomethodology and ethnography, has sent in this report of a recent exciting meeting in Stockholm. After more than a year working and living in Stockholm, I confirm that Sweden deserves its international reputation of a lively conversation-analytic research community, comprising several strong research centres and active networks. Nevertheless, opportunities to meet face to face beyond institutional boundaries and geographical distance are scarce. In order to take time together and talk, but also imagine the future we want to build for our field, we organized – with Barry Brown and a few other precious colleagues I want to thank – a full day event entitled “Working up – and working with – video data in EMCA, today and tomorrow” on the 4th March 2019 in Stockholm. About fifty participants sharing an interest in research on interactions came from the main Swedish cities and research centres – Uppsala, Växjö, Goethenburg, Linköping, Södertorn, Västerås, and Stockholm. Coffee and lunch breaks were given as much space as possible to enable encounters and informal conversations. Starting with the problem he recently faced to transcribe stretches of mostly silent activities, Eric Laurier shared the result of many years of reflection and experimentation on transcription methods, one of his numerous contributions to the field. He showed and discussed how to use “Animated transcripts” in presentations, combining moving images and textual descriptions of actions. In her presentation, Helen Melander Bowden showed several patterns ranging from students’ display of not understanding the exercise, to extensive descriptions specific requests for help to the tutor. Asta Cekaite’s talk focused mostly on head-to-head contacts between adults and children in family and school settings. The presentation brilliantly summarised years of research on touch in interactions, conveying the welcome impression of avenues ahead for yet unthought of directions in our field. Christian Licoppe presented a study also involving Yumei Gan and Christian Greiffenhagen from the Chinese University in Hong-Kong. Many migrant workers leave their children to their parents and maintain contacts with them through video-communication. The authors show how grand-parents and parents prepare for a parent-child face-to-face encounter and how greetings are organised in the first five seconds of the call. An impressive demonstration of the sociological consequences of interactional practices – the recognition problem – in contemporary societies. Leelo Keevallik presented a study conducted with with Anna Ekström: Lindy Hop dancing involves a set of complex and systematic embodied practices, from the couple about to enter the dance-floor, the exiting couple and other potential ones. A quantitative approach also shows that music can suggest a transition relevant point, but certainly does not determine one! Finally, Oskar Lindwall based on analyses of online instructional videos, discussed the limitations of considering naturally-occurring interactions as the only data amenable to EMCA, video-based studies. In a second part, I presented results from the user study of the same project, analyzing three ways participants can use instructional videos in order to achieve the practical task at the same time. I think we were all impressed by the quality of presentations, and are grateful to speakers for their engagement and hard work. While each presentation provided a sound and thorough view on a specific setting or methodological issue, it was fascinating to see striking connections emerge and form a thread as the day went on. Hopefully, we all left with ideas for promising directions and ‘what future we want for our field’. For the time being, let me conclude with many thanks to all the participants for joining and enabling such an inspiring day. This entry was posted in Guest Blogs on March 14, 2019 by charlesantaki. Each year colleagues in Denmark organise an intensive get-together for postgraduates and other early-career researchers who want to delve into the mysteries of ethnomethodology and Conversation Analysis. I’m glad to say that Sophia Fiedler & Søren Sandager Sørensen have sent in this insider’s report…. …then you are at the EMCA Bootcamp of the University of Southern Denmark organised by Johannes Wagner and Dennis Day, in cooperation with the Research Unit “PIPE” (Professional Interaction and Practice). Of course, in advance you get some information and advice of all kinds: bring your linen, discover your inner Paul Bocuse, read your Latour, your Foucault, try to understand Garfinkel (! ), transcribe a conversation between two Americans including a mock-Japanese accent, and bring your bathing suit (which we thought was a joke … well, it wasn’t!). You would never expect that these five days would be such an instructive and enriching event, more than the extensive reading list, before trying it yourself. The fact that a group of 15 PhD students all share the same passion in one way or another – conversation analysis and ethnomethodology (what else?!) – which we discovered within a very short time as we discussed until midnight various issues, such as in what way EM and CA are a micro or macroanalysis (Hilbert), how queues can be immortal (Livingston) or, trying to find out which social practice might be hidden in a collection of 42 transcripts of compliments. Not only lectures including those from Dennis Day (Intro to Ethnomethodology), Simona Pekarek Doehler (Grammar, epistemics and the body: je sais pas ‘I don’t know’ in French interaction) and Søren Wind Eskildsen (A longitudinal perspective on embodied L2 learning) made the week’s program so rich and instructive. Carefully thought-out collection exercises (Jakob Steensig and Johannes Wagner) gave us the possibility to use immediately the methodological ideas behind the texts or lectures we read and heard. In addition, a sensitization to the basic terminology of social action, interaction etc. by Gitte Rasmussen and for a “challenging environment” by Rineke Brouwer augmented the degree of reflection on the vocabulary used every day by linguists. Kristian Mortensen also directed our attention to shared spaces by making us analyse traffic as interaction! Interaction did not only occur in what was presented at data sessions – which included various kinds of data – but also between us, thanks to group activities such as cooking together, collection exercises and text discussions in rather deviant-case-settings (not only around a table but also in the sauna or while having a swim). Moreover, the organisers’ presence during data sessions, lunch, dinner and sometimes even the lectures helped, relaxed and enriched the conversations. This created a motivated, productive and very convivial atmosphere, which made working and discussing a really inspiring experience. The icing on the cake was, of course, the traditional EMCA-song sung at the very end, in order to interiorise all the external stimuli of the past 4 days and in order to make a practice out of something that might have been – until now – only a phenomenon. And when you get home, after 5 days of intense work, laughter, enlightening encounters and discussions you might even miss a little bit this bootcamp-atmosphere (yes, indeed!) replete with allusions to “nerdy” EMCA-terms or data collections about compliments, but with many new ideas and perspectives to follow up on. We would like to thank the organisers for making such an event possible. This entry was posted in Guest Blogs, Uncategorized on January 8, 2019 by charlesantaki. For some areas of linguistics, it may be a bit difficult to make your work accessible to the public without feeling you are betraying yourself, or your knowledge. The fear of trivialising is always at the back of one’s mind. Moreover, when you’re out there on your own, you are the sole representative of the discipline … daunting! And there is also the issue of impact. When you do research on CA on institutional settings, for example, the “impact sell” is perhaps a bit easier than when your passion is the magic that happens in even the most mundane of our everyday interactions. Showing how studying “the ordinary” can make a difference is a challenge, and in this respect, the CA community is really grateful to Liz Stokoe and the work she has been doing making the “science of talk” known to the wider public. On November 17th, as part of York’s YorNight, I presented an exhibition called “Human fusion…in conversation. Explaining Synchronisations through the Science of Talk, Conversation Analysis”. From my collection of co-animations and turn-sharing, I focused only on cases of associative collaborative productions, in particular, choral productions (things “said at the same time”, as I called them), and anticipatory completions (“finishing each other’s sentences”). My aim was to show my audience that these are highly ordered activities that are not about “mind reading” but about the “reading” and negotiation of turn-design features from both the speaker’s and the recipient’s perspective. I used the Royal engagement interview and my data to show how we do this through our wording, tone of voice, gesture, gaze, and the timing of our incomings. I divided my exhibition into five activities. The first was simply my welcome and announcement of my research topic, and a few introductory words with the question “do you want to hear more?”. None of the visitors, after hearing me say I study, among other things, when people “finish each other’s sentences and say the same thing at the same time”, actually rejected the invitation (lots of smiling and eyebrow raising reactions from them there)! My second task was to see the Royals in action, finishing each other’s sentences, as an introduction to the kind of detail and organisation I’m interested in. The next activity was “Find the clues”, but in the end I never got to implement it, as it was just too difficult. It consisted in getting the audience to spot those interesting speaker and recipient behaviours leading up to these synchronisations . Even though I chose, of course, my stellar cases, those that look so perfect they should be in textbooks, it just wouldn’t work. So I decided to play the video again and guide their attention to rhythmic behaviour, clicks, vowel lengthening, hesitation markers, the holding and release of gestures, the predictability of certain grammatical structures. That got the “Wow!” I had hoped for. The fourth activity was called “Sync with me” (or “force sync!”) and it invited the audience to pick a person in the group to pick an idiomatic expression (e.g. “you can’t have your cake and eat it”) out of a bag, which they had to include in their talk, and get the other person to either complete or produce in unison. It worked really well with a teenage brother-sister pair. It even worked with two kids who were around 8-12 – they didn’t know the expressions, but nevertheless they came up with some plausible completions in just the right way! Beyond the startling question “you are planning to get your PhD finished in three years, I presume?” I received from a grandparent, the interactions I had with the audience were really super interesting, and gave me further ideas as to where the impact of my research could lie. Questions going from “are these things learned?” to “are these culturally-sensitive?”, into “how can this help our interaction with people in the autism spectrum?”, to the usual “you must find it impossible to lead a normal conversation with people”, my interaction with people all ages was priceless. As with teaching, or poster presentations sessions at conferences, you get better at pitching your work and targeting your talk at your audience as you go along. This was a five-hour exhibition, and I must have met around 30 families/couples/groups of friends from different backgrounds and interests. I have discussed the detail of everyday talk in a tent space shared with researchers on subjects that the public would not doubt to call “science”, such as Chemistry and Physics. I can only say that I humbly believe I have been successful in showing how studying conversation isdoing science, how unpacking the orderliness of the ordinary can be fascinating, and how we can make a difference to people’s lives by describing how it is that we go about our everyday business of social interaction. This entry was posted in Guest Blogs, Teaching, Uncategorized on November 23, 2018 by charlesantaki. When Conversation Analysts gather, they sometimes analyse excerpts from recordings made by the early pioneers in the 1960s and 1970s – hissy audiotapes or scratchy black-and-white videotape. Some bits are so well known now that they’ve become shibboleths for the knowing community, which can feel off-putting to newcomers. Elliott Hoey and Chase Raymond have been looking into the matter for a forthcoming publication, and I’m very pleased that they’re willing to share their thoughts here. One distinctive research practice in CA is its longstanding reliance on a body of ‘classic’ data. Reading papers, especially from the early days, can sometimes feel like watching a soap opera starring Emma, Virginia, Shane, Geri, and Bud (the show is syndicated in ROLSI, among other places). We’ve been reflecting on this research practice and came up with a few pros and cons of using classic data. This post is based on a chapter in a forthcoming volume The Open Handbook of Linguistic Data Management, edited by Andrea Berez-Kroeker, Brad McDonnell, and Eve Koller – so look out for that when it comes out! To start with the positives, first, the data are convenient. Using classic data precludes the need for the researcher to undertake the laborious work of transcription because transcripts already exist and are of reliably high quality, most having been transcribed by Jefferson herself. And on top of this, these recordings predate review boards, and so no ethical approval is required to use them for research. Second, classic data enjoy wide familiarity within the CA research community. Many if not most analysts know these materials, either from working with them directly or by encountering them again and again in papers, presentations, and data sessions. They embody a kind of material culture for the discipline; not only are they well known, but particular parts of particular recordings have become shorthand for particular phenomena (‘n I’m up here in the Glen?,Sibbie’s sistuh hadda baby boy, yer line’s been busy, etc.). Third, and building upon their familiarity, classic data contribute to CA’s empirical rigor. Because the interactions in classic recordings enjoy widespread recognition, analyses based on them may be more readily comprehended and consequently verified/contested. Fourth, classic data are empirically generative. Contemporary CA research continues to be informed by these materials some half a century later. They are routinely a source for novel findings on their own (e.g., Holt, 2017) and also serve to corroborate analyses that are based on newer data (e.g., Clift, 2014). 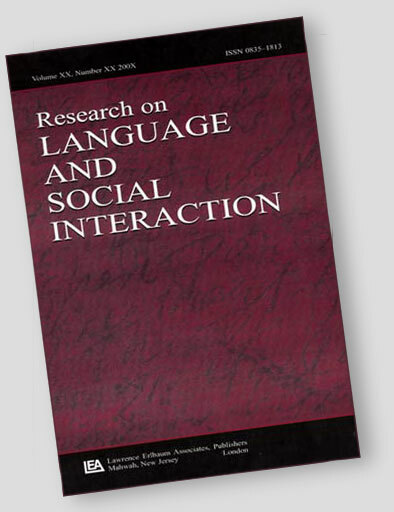 Methodologically, the continued usability of classic data and the endurance of the findings they have engendered together point to the strength and reliability of CA methods for analyzing interactive language use. The practice of relying on classic data is not unproblematic, however. From a less flattering perspective, they are not ‘classic’ but rather ‘legacy’ data that can inhibit scientific development and exclude particular groups. Overreliance on specific data necessarily guides the kinds of questions that we (can) ask, the places we look for answers, and the shape such answers take. This kind of inertia or myopia isn’t specific to CA, however; a founder effect is likely to appear in any discipline with strong links to its original documents. Perhaps the most pernicious effect of classic data is its contribution to the English-bias in CA. While this is a natural consequence of CA’s historical emergence (anglophones analyzing English data), it can also have an exclusionary effect. Papers using English data will be read and cited more, while research on and researchers of other languages are at a comparative disadvantage. Similarly, those who might otherwise be interested in or convinced by CA may turn elsewhere. Third, there’s something of an uncritical acceptance of the data. Their importance in the establishment and development of CA is unquestionable, but this doesn’t mean they should be treated as sacrosant. This can serve to obscure the unavoidably political act of rendering speakers into text. Finally, another way the research practice may exclude emerges from its communal familiarity. The extensive use and recognition of these sources as well as their cultural importance for the discipline produces the appearance of communal ownership—that everyone has these recordings and transcripts. But this is a false communality. Access to the classic data is not equal, and in fact appears to be confined to those with connections to CA’s historical centers of gravity. We make these observations as a way to encourage reflection on the use of classic data, especially regarding our practices around data sharing. Classic recordings and transcripts are not merely the materials out of which we fashion our findings. Perhaps that is what they were at the time of recording, but today they also stand as objects that mediate our professional relationships and shape our disciplinary culture. This entry was posted in Guest Blogs on November 16, 2018 by charlesantaki. The EM/CA doctoral network in the UK has the excellent practice of arranging twice-yearly meetings for graduate students doing EM/CA work. A chance to talk, share ideas and experiences and feel part of a bigger research community. The most recent meeting was held at King’s College, London in October 2018. Melissa Bliss reports. The 10th biannual EM/CA Doctoral Network event was hosted by King’s presentations and no less than thirteen data sessions. To illustrate the range of sites of EM/CA work, 24 students participated from twelve UK universities and, a welcome addition, four international universities. Our host Jon Hindmarsh welcomed us, especially those from Spain, Finland, Russia and Switzerland. We were then off to a flying start into parallel data sessions. The first strand was on family interactions with Tiina Eilittä (Oulu) presenting her video data on multiactivity and attention drawing and Tilly Flint (Ulster) with her data on conflict in family interactions. In the other strand on collaboration Christoph Hottiger (Zurich) shared his video data on people interacting with science centre exhibits and Juan Pablo Martinez Avila (Nottingham) showed his data of acoustic musicians collaborating in rehearsals. After an excellent lunch provided by KCL we heard two interesting presentations. Jack Joyce (Loughborough) showed examples of resisting challenges in conflict and Mari Holmström (Oulu) analysed coworkers’ displays of identities in break room discussions using membership categorisation analysis. There was a lively discussion on the challenges of translating the Finnish category words pätikkä and täti into English. We then went back into data sessions. One strand was on healthcare settings. Rebecca Anderson (UCL) shared her data on conversations between healthcare professionals and relatives of patients at the end-of-life. Ethan Shapiro (Northumbria) showed us his video data of clinical handovers between paramedics & emergency department staff. The other strand focused on moral orders with Claire Melia (Keele) bringing her data on a group discussion about alcohol use in which people shared their own stories about alcohol consumption. Paula Greenlees (Edinburgh) shared her interesting data on categories and moral accountability in the form of a YouTube video of a judge from the Australian royal commission into institutional child sexual abuse questioning elders from the Jehovah’s Witnesses about their practice of “shunning” of those who speak out about sexual abuse. The day closed with keynote speaker Dirk vom Lehn (KCL) on how to find a ‘research setting’ and a ‘research question’. He illustrated this from his empirical work on looking at art objects and the practices of optometrists conducting eye examinations. His interesting talk reflected the host university’s strong focus on workplace settings. We then had dinner in the heart of London’s theatreland with much enjoyable conversation and networking. The second day started bright and early with two interesting presentations by researchers in the early stages of their PhDs. Jose Gustavo Berumen Salazar (Nottingham) shared his research on supporting practices through fast moving consumer goods with an examination of cooking practices and the role of recipes. Chamathka Kariyawasam (Edinburgh) outlined her plans to study family leisure travel practices in the setting of Galle Fort in Sri Lanka. Chamathka was accompanied by her young daughter who celebrated her first birthday at the meeting, without doubt our youngest participant to date. Next we went back to data sessions. The first was on language learning with Nathaly Gonzalez-Acevedo (Barcelona) sharing her video data of pre-schoolers’ language learning with the use of iPads and Nimet Copur (Newcastle) showing us video excepts of student initiated humour in EFL classrooms. The other strand focused on routine procedures in two very different settings. Shawn Bodden shared his interesting data on multimodal interactions with material objects in alternative cultural spaces in the form of a livestreamed video of Budapest police interacting with activists resisting a household’s eviction. This lead to a lively debate about the possibilities and constraints of video at adequately capturing interactions in crowded and noisy situations. Kristina Popova (Higher School of Economics, Moscow) shared her data on mastering laboratory work by psychology students learning to do transcranial stimulation experiments. After another excellent lunch we had the final two data sessions. The first focused on classroom practices with Emma Greenhalgh (Sheffield) sharing her findings on elicited storytelling as a pedagogical task in the ESL classroom and Keith Walker (Liverpool) investigating the social construction of boredom in the classroom. In the second Melissa Bliss (Queen Mary University of London) shared her data on older age identity constructions in a YouTube video and comments. Our final presentations were on reporting troubles. Yarong Xie (Edinburgh) presented her ‘modest proposal’ on reporting racism and Marc Alexander (Loughborough) showing us examples of invoking third party agencies by people telephoning neighbour dispute resolution services. It seems apt that this final presentation was by a researcher who had just submitted his thesis. We soundly congratulated Marc and wished him a good viva in December. The meeting concluded with a question and answer session chaired by our host Jon Hindmarsh which covered the perennial questions of the EM/CA student: the pros and cons of various software for recording, transcribing and analysis; where to publish our work, and how to make our work more publicly accessible and socially useful. Jon Hindmarsh and Andrew LaBonte at KCL are to be congratulated for organising a lively and stimulating meeting. We extend our thanks to LISS-DTP for sponsoring the event. The EMCA Doctoral Network continues to grow in strength and stature and provide an important supportive and stimulating setting for developing EMCA scholars. This entry was posted in Guest Blogs on November 12, 2018 by charlesantaki. Occasionally something in the news strikes a resonant chord with those with Conversation Analysis- tuned ears – and the laughter that treated President Trump at the UN on 25th September 2018 was just such an occasion. I’m delighted that Alexa Hepburn has been willing to bring her expertise to bear on a geopolitically sensitive question: was Trump laughed at? Or was the audience laughing with? There’s a reason that the English language has 50 words for laughter (well, a lot anyway). We can snigger, titter, chortle or chuckle, and giggle, cackle, guffaw and roar. But why? What’s it all for? Enter the conversation analyst! Careful transcription reveals not simply what type of laughter we’re dealing with, but also facilitates analysis of the actions that it manages and responds to. The following is a transcript of the 30 seconds in which Donald Trump dealt with audience members’ laughter during his speech to the U.N. General Assembly in New York on the 25th of September 2018. Trump arrived late – he was only leaving Trump Tower when the speech should have started, the schedule was changed to accommodate his lateness. This might not have endeared his audience to him. We join Trump around 40 seconds in. Trump begins his speech with strong claims about his administration’s achievements on lines 1-3. According to Anita Pomerantz, explicit self-praise is a dispreferred action, though perhaps less avoided in this context where listing one’s country’s achievements might be relevant. However, on line 4 some members of the audience treat Trump’s utterance as laughable – a highly disaffiliative response. How does Trump deal with the laughter? In response, Trump cuts off where he was headed on line 5 to gaze at the culprit/s and reiterate his point with a half-smile (line 6). This clearly treats the laughter as undermining the truth of his initial claim – as laughing at. Over the next few seconds, the audience laughter grows louder (line 8). What’s interesting is how Trump deals with this. This time, rather than reiterating his point further, or ignoring it and soldiering on, he issues a sharply exhaled laughter particle on line 9. By laughing right here, Trump is able to recast himself as breaking out of his speech to laugh along with, rather than continue and be laughed at. Further laughter from the audience ensues (line 10). He continues the break from giving his speech to explicitly attend to the laughter as unexpected – as a dispreferred response, not something he wanted to elicit (line 11). But note that he does this while smiling then laughing himself. In our studies of post completion and interpolated laughter, Chloe Shaw, Jonathan Potter and I often saw it as a way of modulating some problem or insufficiency with the action one has just done, while nevertheless doing it. Without the smiling and laughter line 11 would sound more hurt and reproachful. The loudest audience laughter comes at this point on 13 with some applause – here it is at least partly hearable as appreciation of Trump’s candid and jokily delivered confession. The open-handed gesture indicates Trump’s ‘nothing to hide’ posture. So was Trump laughed at or was he laughing with? This is to some extent true towards the latter half of this sequence. While Trump at first is clearly laughed at and attempts to reiterate his initial claim on line 6, it’s not clear that later on in the sequence everyone laughed at Trump. His treatment of the laughter from line 9 onwards would have been disarming for some, and it is telling that the loudest laughter and some applause can be heard following his jokey sequence closing turn on line 11. So the answer is: yes, Trump was laughed at, but his media skills enabled him to modulate what could have been a moment of public ridicule, and provide some support for his claim that he and the audience were laughing along together. This entry was posted in Guest Blogs on October 1, 2018 by charlesantaki. Conversation analysis is increasingly being rolled out as a method for practitioners to use in their work, or at least as a corrective to the idea that all qualitative research is simply a matter of interviewing people. If it has the effect of sensitising them to the ebb and flow of talk in their everyday practices , that’s a bonus. I’m delighted that Oxford early-career researcher Charlotte Albury has written us a blog about her experiences in putting CA in front of a group of medical practitioners. Recently I was invited to teach Conversation Analysis at the University of Antwerp. Their qualitative research methods summer school trains clinicians, quantitative researchers, and research students in qualitative research design; analysis; and appraisal, with a focus on clinical settings. This year, three lectures were dedicated to conversation analysis. The aim was to provide the group with an overview of CA, how it can be used in clinical settings, and discuss the types of research questions that CA can best answer. This was a good opportunity to test some new activities, which I had designed to be relevant for the range of learners and experience in the class. Here I’ve described three activities that I found worked particularly well for introducing CA to a mixed experience learning group. I started a session with this exercise and it was great to refer back to, as I expanded on each of these concepts throughout the day. I put up a slide that said “I didn’t call him stupid”, then asked someone to read it out (I didn’t call him stupid). After this I asked if anyone could interpret this differently, and another learner read is emphasising a different word (I didn’t call him stupid). I repeated this until we’d drawn out 5or 6 different meanings, which initiated a discussion about what we might be missing when working with a verbatim transcription. I asked how we can make the meaning clearer, students suggested underling the emphasised word, or sound, and indicating where the pauses were, as this could change the meaning. I enjoyed this exercise as students identified for themselves the value of capturing how talk was delivered, and it introduced our subsequent activities and discussions about Jeffersonian transcription. How would Gail Jefferson have transcribed that? Most learners had come to learn skills in interviewing and thematic analysis and were not planning on using CA in their research projects. However, CA literature has much to offer their research, and their literature reviews. Previous discussions with similar groups identified ‘unusual transcripts’ as a barrier to incorporating CA literature, so I was keen for learners to be familiar enough with transcription conventions to go looking for literature, and to confidently be able to read and interpret these studies. Doing transcription is a brilliant way to learn what it all means, but asking learners who are new to qualitative research to transcribe a large amount of data can be quite overwhelming, so I decided to try a “1 min transcription challenge”. Two lines of talk, a transcription key, audio on a loop and 1 minute to see what they can do. This was really successful, and the learners were more confident as we went on to read and discuss CA studies. I designed all activities to be as learner-led as possible so they could discover for themselves the key principles underlying CA. Learners said they found these sessions a “fantastic first introduction to the world of conversation analysis”, and one particular clinician said “it’s made me see conversation in a whole new light”. Most learners reported that they would take many of the concepts we uncovered with them into clinical practice, and were keen to learn if CA research has explored their clinical speciality “Are there studies on end of life care?” “How about unexplained medical symptoms, or giving bad news?” “What about smoking cessation advice?”. In our last session we had a dynamic discussion about clinical CA studies and I could see the learners had realised the exciting possibilities of conversation analytic research. This entry was posted in Guest Blogs, Teaching on September 20, 2018 by charlesantaki.